Title : What's Up with My Family? While I'm not sure that kids will voluntarily pick this up, I really liked this little informational book on how to get along with your family for kids. The size and format is extremely accessible with three issues addressed in the three books in the series. Information is broken up into bite-size chunks including quizzes, quotes from real tweens/teens, lists, tips, and bits of narrative presented in graphica format. I really thought the advice was good, even for adults in terms of how to get along and understanding multiple points of view, especially in emotionally charged situations. I would recommend this for parents as well as kids because it could help both parties get along. It also does a good job of portraying a variety of races and family situations, although not physical disabilities. However, one might argue that it's a little expected that the Hispanic family is large and owns a Mexican restaurant and the African American girl lives with just her mom. I'm not sure kids will pick this one up on their own but the messages are great and the layout (a mix of short text, cartoons and suggestions) is very appealing. School counselors should have a this series on hand! Annie Fox Matt Kindt - When Annie Fox's first book People Are Like Lollipops (Holiday House) was published, she wasn't old enough to legally sign the contract! By the time she turned 21, though, she decided that helping kids would be her life's work. After graduating from Cornell University with a degree in Human Development and Family Studies then completing her Master's in Education, she began exploring ways to use technology to entertain kids while building their emotional intelligence skills.In 1977, Annie and her husband David opened Marin Computer Center, the world's first public access microcomputer facility. Her work there led her to write her best selling book, Armchair BASIC (Osborn/McGraw-Hill). After a detour into the world of screen writing, Annie returned to computers as an award-winning writer/designer of children's CD-ROMs. (Putt-Putt; Madeline; Get Ready for School, Charlie Brown; and Mr. Potato Head Saves Veggie Valley are just a few of the titles on which she worked. )At the dawn of the Internet age, Annie dreamed up the idea for The InSite (TheInSite), a place "for teens and young adults to turn their world around." She is the creator, co-designer, writer, and executive producer of that award-winning site. One of The InSite's most popular features is Hey Terra, a Cyberspace Dear Abby. Annie's first book for teens, The Teen Survival Guide to Dating Relating Real World Advice About Guys Girls Growing Up And Getting Along (2000, 2005 Free Spirit Publishing), is based on hundreds of emails to Terra and Annie's responses to them. "Teen Survival Guide" is now available as a free PDF download from TeenSurvivalGuide.Are You My Friend a Read-it-to-Me iBook was written by Annie Fox, illustrated by Eli Noyes and produced by Electric Eggplant. This digital story book for 4-8 year olds is the first of the Raymond and Sheila Series and is now available in print form on , and as Android apps for Kindle Fire, Nook Tablet, and other Android tablets. The second Raymond and Sheila story Are We Lost is now available in print and for Kindle. Also available in Spanish. See RaymondAndSheila for more info.Annie's other books include: Teaching Kids to be Good People, Too Stressed to Think A Teen Guide to Staying Sane When Life Makes You CRAZY, co-authored with Ruth Kirschner (Free Spirit Publishing) and the popular 3 book Middle School Confidential™ series (Free Spirit Publishing). 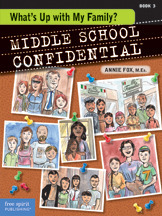 Annie's Middle School Confidential apps are available on most mobile devices (see MiddleSchoolConfidential).Through her conference appearances and public events for kids, tweens, teens, parents, and educators, Annie continues working toward her goal of empowering young people through increased emotional intelligence skills, social courage, and stress-reduction strategies. Her new book for 8-12 year old girls, The Girls' Q&A Book on Friendship , is now available in print and for Kindle.